in order to gain insight into these processes. tion of micronutrients has not been assessed previously. close, high stature forests (18 - 25 m; valley and slopes). ves with a healthy appearance were collected and pooled. samples were analyzed for each plant species. (SIRFER), University of Utah (Salt Lake City, USA). species have been previously reported [14,18]. Table 1. 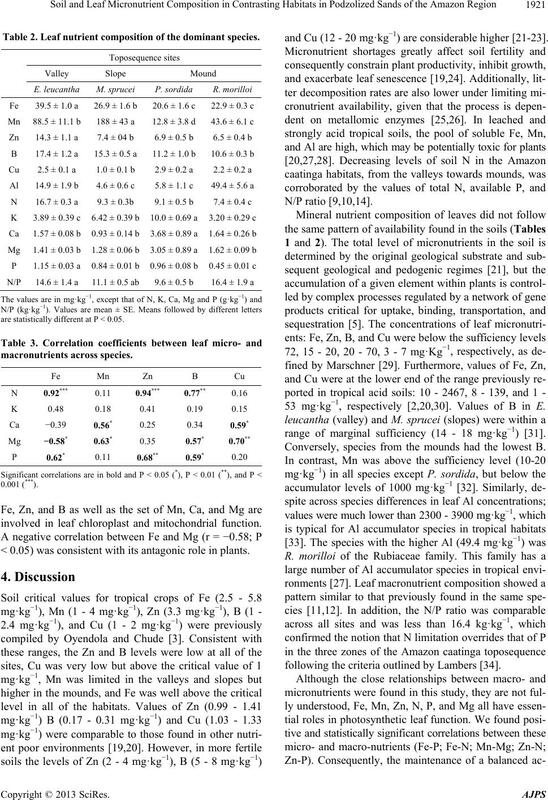 Soil characteristics and nutrient composition. statistically different at P < 0.05. = 0.71; P < 0.05). leys: (Mn: 0.62 ± 0.14 vs. 0.87 ± 0.08; Cu: 1.33 ± 0.01 vs.
of that in the valley (139 ± 32 g·kg−1), respectively. mg·kg−1) compared to slopes and valley, respectively. mg·kg−1) as well as the highest C/N ratio (32.4 ± 1.4 vs.
in slopes and valley, respectively. as compared to P. sordida (11.2 ± 1.0 mg·kg−1) and R.
species except P. sordida (mound; 12.8 ± 3.8 mg·kg−1). Table 2. Leaf nutrient composition of the dominant species. are statistically different at P < 0.05.
involved in leaf chloroplast and mitochondrial function. 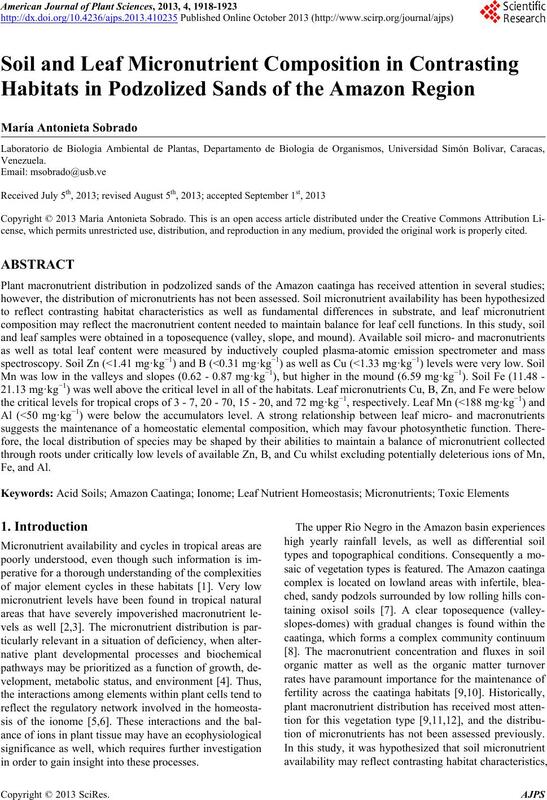 < 0.05) was consistent with its antagonic role in plants. and Cu (12 - 20 mg·kg−1) are considerable higher [21-23]. 53 mg·kg−1, respectively [2,20,30]. Values of B in E.
range of marginal sufficiency (14 - 18 mg·kg−1) . Conversely, species from the mounds had the lowest B.
following the criteria outlined by Lambers . the habitats of the Amazon caatinga toposequence. Al may be toxic in valleys and slopes. ability to exclude Mn, Fe, and Al. tions to improve the manuscript. 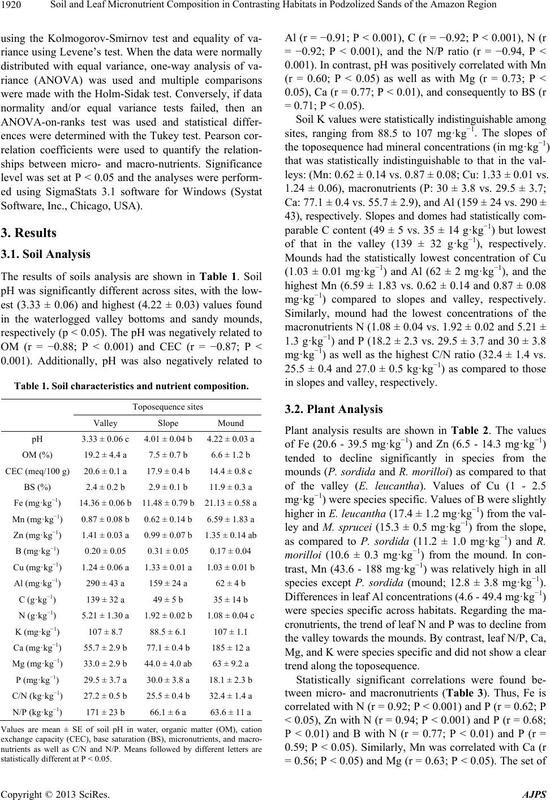 Soils,” Journal of Plant Nutrition and Soil Science, Vol. 173, No. 3, 2010, pp. 453-460. Plant Physiology, Vol. 154, No. 2, 2010, pp. 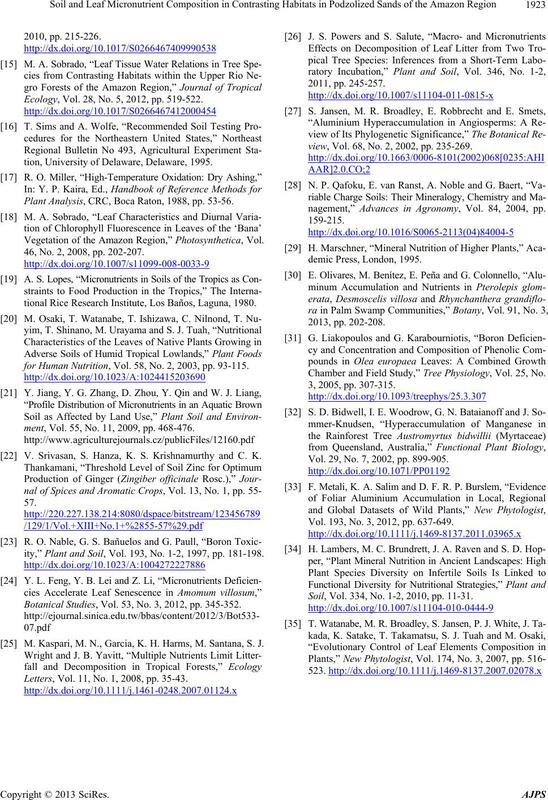 512-515.
neral Nutrients,” Current Opinion in Plant Biology, Vol. 12, No. 4, 2009, pp. 381-386. UNESCO, Paris, 1985, pp. 108-110.
est Research, Vol. 27, No. 6, 1997, pp. 831-839. 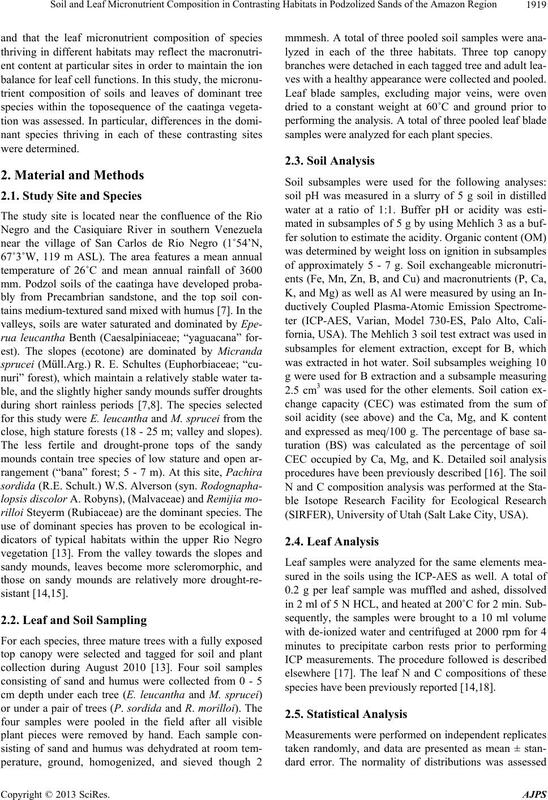 Organic Matter in Sustaining Soil Fertility,” Nature, Vol. 371, No. 7464, 1994, pp. 783-785. Leaves of the ‘Bana’ Vegetation,” Oecologia, Vol. 45, No. any, Vol. 6, No. 4, 2011, pp. 141-149. Ecology, Vol. 28, No. 5, 2012, pp. 519-522.
tion, University of Delaware, Delaware, 1995. Plant Analysis, CRC, Boca Raton, 1988, pp. 53-56. Vegetation of the Amazon Region,” Photosynthetica, Vol. 46, No. 2, 2008, pp. 202-207.
tional Rice Research Institute, Los Baños, Laguna, 1980.
for Human Nutrition, Vol. 58, No. 2, 2003, pp. 93-115.
ment, Vol. 55, No. 11, 2009, pp. 468-476. 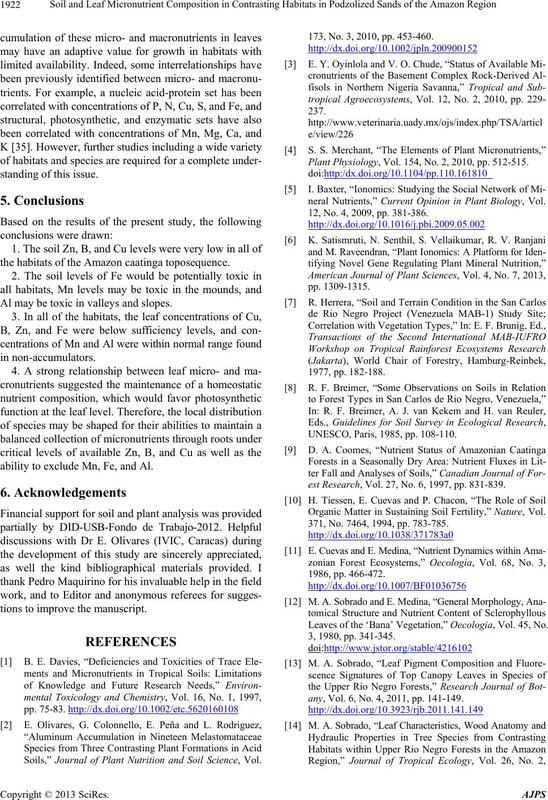 V. Srivasan, S. Hanza, K. S. Krishnamurthy and C. K.
ity,” Plant and Soil, Vol. 193, No. 1-2, 1997, pp. 181-198. Botanical Studies, Vol. 53, No. 3, 2012, pp. 345-352. M. Kaspari, M. N., Garcia, K. H. Harms, M. Santana, S. J. Letters, Vol. 11, No. 1, 2008, pp. 35-43.
view, Vol. 68, No. 2, 2002, pp. 235-269.
nagement,” Advances in Agronomy, Vol. 84, 2004, pp. Chamber and Field Study,” Tree Physiology, Vol. 25, No. Vol. 29, No. 7, 2002, pp. 899-905. Vol. 193, No. 3, 2012, pp. 637-649. Soil, Vol. 334, No. 1-2, 2010, pp. 11-31.